Velvet Bridal wear gown . Full Front back work . Golden jari work. 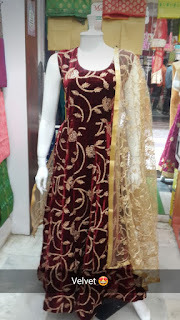 2019 latest fashion bridal wear velvet collection. To buy come our shop pooja collection dombivli . Full duppta work . Net duppta full work .